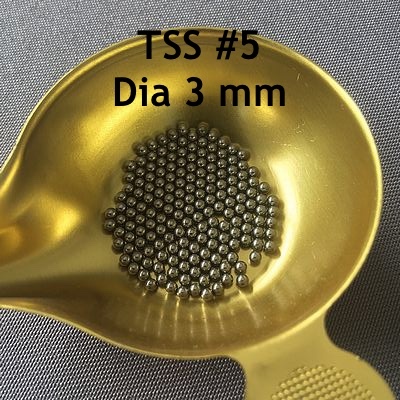 TSS # 5 with a diameter of 3 mm is the biggest ball I propose for hunting waterfowl. It is the lead equivalent of a ball of 0 at the penetration level which makes it a ball well suited to extreme shots due to its significant lethality. It is very useful for larger birds such as Canada Geese. TSS # 5 (3 mm) pellets are ideally suited to pull geese up to at least 80 m. In fact, the 56 mm (required for gray goose) entrance exceeds 95 m. The cover of shower at 80 m is only 0.7 balls dm² for a charge of 40 grams classic which is insufficient for a target that has a surface of about 3 dm². It is therefore a ball that will allow to shoot all species of geese at a great distance but provided they shoot large loads. Given the penetration at 50 m, it is not recommended to draw a duck at this distance with this type of pellet. The cover of ther pattern will be weak and moreover the considerable energy will probably bring the ball to cross completely the bird. This is really a shot for big geese to shoot with big loads. I invite you to go on the blog to consult the table of the loads according to the game.